After over 40 years of continuous service to the ESO, 22nd May 2018 was Stephen Pirie’s last official teaching day at the School. He had a well-deserved send-off at lunchtime, attended by faculty, students and staff. Stephen has been an integral part of the ESO’s development, being the School’s first Vice-Principal and one time Head of Faculty. 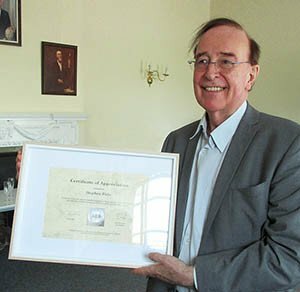 Dr Paula Fletcher presented Stephen with a framed image of Boxley House, along with Certificate of Appreciation for all that he has given to the School over the years. Students also presented Stephen with a leaving gift and card. He will be missed.